Greenville Senior High School’s Navy Junior Reserve Officers Training Corps hosted a Pass-In-Review ceremony on Thursday. 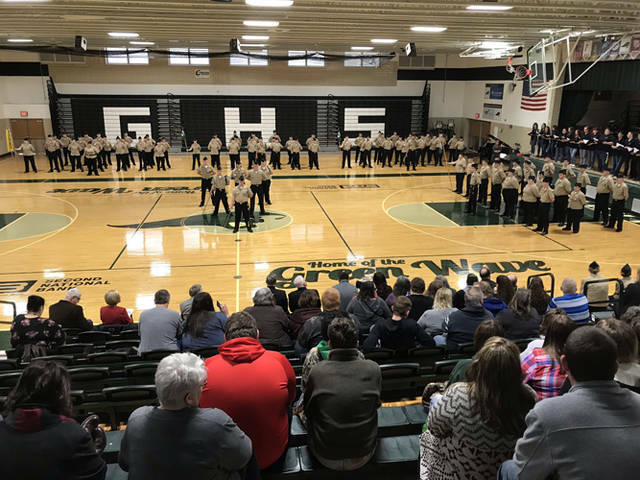 GREENVILLE – In front of almost 100 spectators, Greenville Senior High School’s Navy Junior Reserve Officers Training Corps hosted a Pass-In-Review ceremony on Thursday. The ceremony was an opportunity for Greenville’s NJROTC program, which is comprised of 103 students, to recognize students who earned awards and promotions. The students also presented drills, and Greenville’s program was reviewed by Captain Mike Stiglitz of the United States Navy, who retired from active duty last year. “I am totally blown away by the community support for this program,”said Stiglitz, who resides in the Tampa, Florida, area. Greenville High School’s Waivaires were part of Thursday’s program, singing the national anthem and the Navy Hymn. Greenville’s NJROTC students performed a pair of drills, Charlie Company’s basic drills skills demonstration led by Platoon Commander Cadet Petty Officer Second Class Rodney Richard and the Competition Armed Exhibition Drill Team’s demonstration led by Cadet Petty Officer First Class Logan Shields, prior to comments from Principal Stan Hughes and Stiglitz. After the comments, 17 cadets were bestowed outstanding personal appearance medals, 14 were presented orienteering ribbons, and 12 earned color guard ribbons. One cadet earned the physical fitness ribbon, three were awarded the physical fitness ribbon with a bronze lamp, five were awarded the physical fitness ribbon with a silver lamp, 20 earned the community service ribbon, six received the Area 3 marksmanship ribbon, and two earned the Area 3 high score medal. 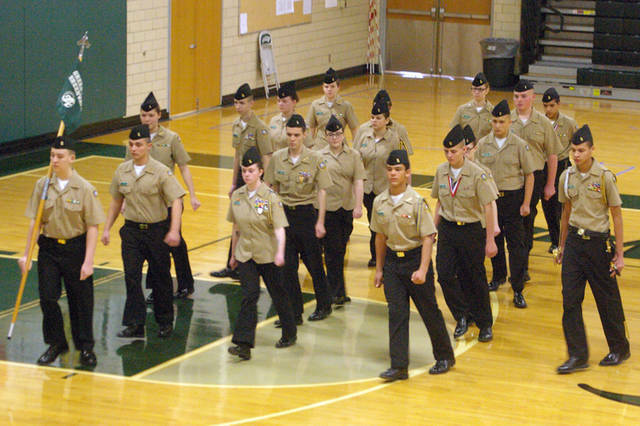 Thirteen cadets earned a star to be worn over their NJROTC bar for being on the merit honor roll, 22 were named to the honor roll and were awarded a star to be worn over their NJROTC bar, and one earned a place on the highest honors honor roll and received two stars to be worn over her NJROTC bar. Eight students were advanced to the rank of seaman apprentice, seven were advanced to the rank of seaman, one was advanced to the rank of petty officer third class, four were advanced to the rank of petty officer second class, and one was advanced to the rank of ensign. “This is a very impressive group of young men and women,” Stiglitz said “It was a real pleasure to come up and review this program. The NJROTC program is an extracurricular class at Greenville High School that teaches military knowledge, discipline and respect. In order to maintain the NJROTC program, the Navy requires schools to have a minimum of 10 percent of the school’s population in the program. This year the Green Wave Navy includes more than 13 percent of the school’s enrollment. 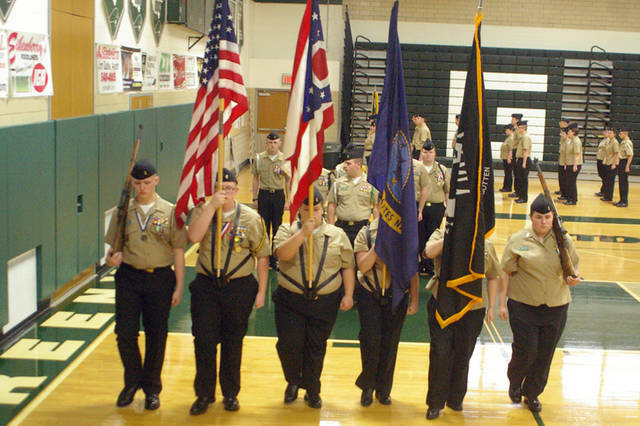 The Green Wave Navy was recognized for the 2016-17 school year as the most improved unit in Area 3 – which consists of 54 schools from West Virginia to Nebraska and Kentucky to Michigan – and received the NJROTC Unit Achievement Award. Last school year the unit was recognized as a distinguished unit with honors, the highest unit award offered to a NJROTC unit. Greenville was one of two schools in the state of Ohio to receive this award, and it awarded to only the top 20 percent nationally. Captain Scott Eberwine, retired from the United States Navy, is Greenville’s senior naval science instructor, and Chief Stephen Eldred, retired from the United States Navy, is Greenville’s naval science instructor. Jacob Brodrick is Greenville’s NJROTC’s commanding officer, David Hartsock is the executive officer, and Dru Quinn is the command senior chief. Adam Godwin and Victoria Gibboney are supply officers, and Nikkei Denlinger is the administrative officer. Nathen Henning served as the master of ceremonies for Thursday’s Pass-In-Review. 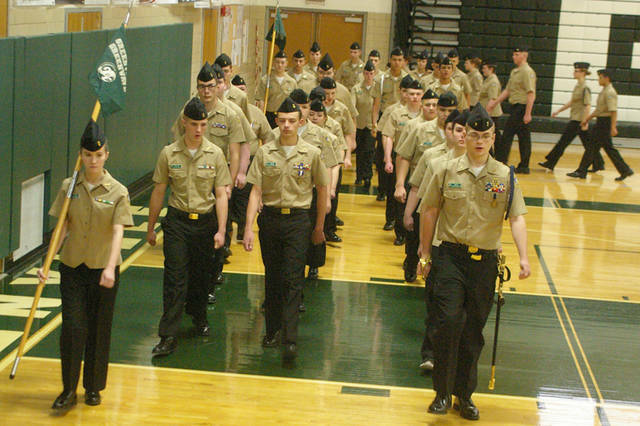 This entry was tagged Green Wave Navy, Greenville, Navy Junior Reserve Officers Training Corps, NJROTC, Pass-In-Review. Bookmark the permalink.